London is one of those iconic cities that every traveller should visit at least once in their life. You could live there for years and never see it all but you can have fun trying. Why wouldn’t you want to visit London? If history was a city, it would be London. The Romans, The Vikings, The Royal Family, The Plague, The Great Fire, Jack the Ripper, The Suffragette Movement, The Swinging 60s… In addition to this, it’s one of the coolest cities on the planet with a thriving theatre scene in the West End, world-class shopping, international superstars, architecture from every era and an incredibly cosmopolitan food scene. The London Pass with Free Entry to 60 Attractions – If time is limited, this is a must have as not only does it give free entry to museums, sporting venues, Royal residences and tours etc. but also fast-track entry to many top attractions,1 free day Hop on/Hop off sightseeing tour bus & many discounted offers. Classic London 3-Hour Bike Tour – A really cool guided experience around some of the most famous landmarks of the British capital by bicycle for those of a reasonable fitness level. City Sightseeing Tour with St Paul’s & Tower of London – Explore two of the most iconic buildings in the whole city. Designed by Sir Christopher Wren, St. Paul’s Cathedral is the seat of the Bishop of London and is where Prince Charles & Princess Diana were married. St. Paul’s has played host to many notable events in British history including high profile funerals, the Jubilee celebrations of Queen Elizabeth the 2nd and even an anti-capitalism protest by Occupy London in 2011. The Tower of London, in fairness, is not the biggest tower you will ever see but it is certainly one of the most interesting. With an incredible history and located on the North bank of the River Thames, this home of The Crown Jewels is not to be missed. Coca Cola London Eye 4D Experience Tickets – This enormous Ferris wheel on the South bank of the River Thames opened to the public in 2000 and offers passengers amazing views from the 32 capsules. 4D Experience Tickets – This multi-sensory 3D film experience includes wind, bubbles & mist which brings London to life. Westminster Abbey & Changing of the Guard 2.5-Hour Tour – Westminster Abbey is one of the most important buildings in British history. The Duke & Duchess (Wills & Kate) married at the Abbey in addition to coronations, state funerals and Poets Corner. Changing of the Guard is an impressive and very traditional military ceremony. This regiment is unmistakable in their red tunics & bearskin hats. London: Afternoon Tea Cruise on the River Thames – Perhaps the most civilised tour you will ever take! What could be more British than afternoon tea? London Ghost Walk: 2.5-Hour Guided Tour – With such a phenomenal history you can only imagine the amount of paranormal activity & ghostly goings on in Ye Olde London Town. You will visit the reputedly most haunted sites and hear chilling tales… Not for the faint hearted. 1. Madame Tussauds Wax Museum – Truly fascinating life-size replicas of the famous and infamous from the world of celebrity, sport, royalty, history & politics. Not to mention a superb gift shop! 2. See a West End Show – The biggest stars in show business trip over themselves to star if not produce some of the best performances of the biggest shows. Agatha Christie’s The Mousetrap has been showing at St. Martin’s Theatre continuously since 1974 making it a record breaker but was first opened in The West End in 1952. 3. See an Exhibition – There is always, always, always something on show and no shortage of venues such as The Victoria & Albert Museum, The National Gallery and Natural History Museum to name but a few. 4. Tennis at Wimbledon – If you can, you must, if you are a tennis fan of course. Not only is this one of the biggest annual sporting events in the country but a prime opportunity to people watch and celebrity spot. The excitement and atmosphere is unmatched (pun intended!). 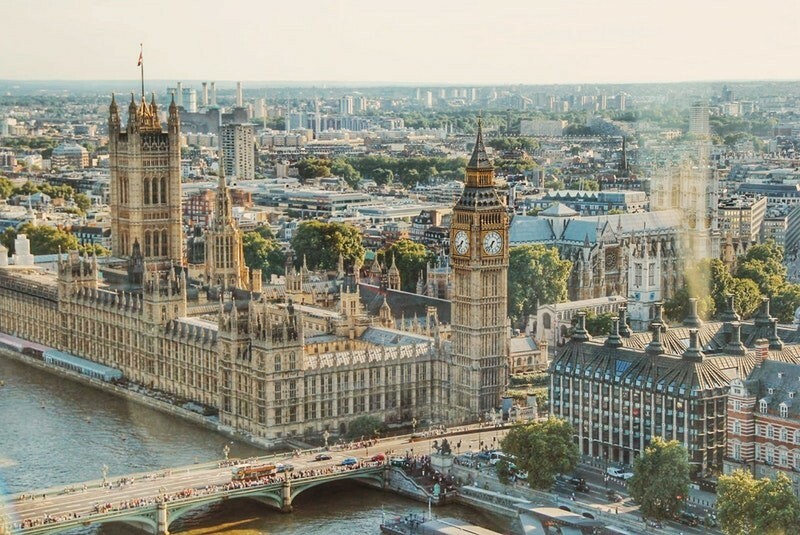 London is home to some of the most luxurious and famous hotels which most people can only dream of, but there are so many reasons for being in London and accommodation to suit. Covent Garden, Piccadilly & Soho are great for Theatre Lovers. Shoreditch & Hoxton are for the Hipsters. Canary Wharf & City of London for business orientated & sightseeing trips. Wembley for… well, Wembley! Sports & Concerts. Base yourself by what is important to you. The Soho Hotel, Firmdale Hotels – This hotel is situated on a quiet street in the heart of London’s entertainment neighborhood. The Piccadilly London West End – Located just around the corner from the watchful eye of Eros, the statue poised above Piccadilly Circus. W London Leicester Square – Luxury hotel with vibrant decor located steps away from theatreland, the catwalks of Brewer Street and Soho’s electric nightlife. Nobu Hotel Shoreditch – They use Asian-inspired and London-infused sights, sounds, scents, and experiences to engage and delight our guests from their moment of arrival. The Hoxton, Shoreditch – Located less than 1.6 km from London’s Liverpool Street. It has a contemporary style with features like fireplaces and exposed brickwork. CitizenM London Shoreditch – Old Spitalfields Market is an 8-minute walk away, and Brick Lane Market is a 9-minute walk away. Shangri-La Hotel at The Shard, London – Each uniquely designed guest room has floor-to-ceiling windows providing spectacular views of the city and maintains the theme of Oriental elegance. Cheval Three Quays at The Tower of London – This hotel is located next to the Tower of London, and overlooking the Thames River. London Marriott Hotel West India Quay – This is a five-star hotel has luxury rooms and a state-of-the-art fitness suite. St George’s Hotel – The London Designer Outlet is located adjacent and offers a range of shops and places to eat. Plus the Wembley Arena is a 6-minute walk away from the hotel. Hilton London Wembley – You will find this hotel overlooking the iconic Wembley Stadium and set next to the historic Wembley Arena. It is also near the London Designer Outlet. Holiday Inn London – All of their rooms have large windows and modern décor and interactive features. Typically the day will start with ‘the full English breakfast’ which essentially is a heart attack on a plate. Fried everything! Bacon, sausage, egg, black pudding, bread (yes, fried bread), mushrooms, tomatoes and sometimes baked beans all washed down with a nice cup of tea. Sunday Lunch is an event in itself. Many hotels will offer a ‘Carvery’. Generally consisting of a roasted meat (usually beef), gravy, roast potatoes &/or parsnips, Yorkshire pudding, cauliflower & cheese sauce or perhaps Brussels sprouts. Afternoon tea (often champagne rather than tea) with delicate sandwiches, bite sized cakes and scones. To do this in style, The Ritz or The Savoy but pretty much on offer everywhere. As for dinner… fish & chips, bubble & squeak, toad in the hole, bangers & mash, Lancashire hotpot… Enjoy Googling that lot! Being such a Cosmopolitan place there are many fantastic places to eat. International food is just as popular as good old British pub grub. For great Chinese food, China Town has an amazing selection of restaurants. For a good curry, look no further than the Brick Lane area in East London. Covent Garden has a great variety of places to eat, particularly for a ‘pre-theatre’ meal. For a meal with a view, it has to be The Shard which has many restaurants to choose from. Camden Town in North West London is fantastic at the weekend. Camden Market and Camden Lock are easily accessible by public transport. Buzzing with people browsing for bargains at craft stalls, clothing, street food, listening to music and enjoying the atmosphere. Sightseeing in London is pretty easy on foot. Westminster offers Westminster Abbey, Big Ben, The Houses of Parliament & Downing Street. Over the Bridge, you can have a lovely stroll along the South Bank or go to The London Aquarium and The London Eye. All the Royal hotspots are close together too. Buckingham Palace, The Mall, Clarence House, St James’s Palace & Park, Kensington Palace with Kensington Gardens which has a bronze statue of Peter Pan! Hyde Park & The Serpentine Lake are absolutely & beautifully peaceful. Dating back to the time of Henry the 8th, this is one of London’s best-known Parks with literally miles of walks including The Princess of Wales Memorial Fountain which was opened in 2004. This park is popular for concerts & a variety of outdoor pursuits including cycling, horse riding and skateboarding. You can even swim in a section of the lake. Hampstead Heath is rich in wildlife, has a zoo and excellent opportunities for swimming either in the Lido or the 3 ponds. Epping Forest is London’s largest open space and again is popular for walking, jogging, cycling and horse riding. Without a doubt, London is brimming with culture. As previously mentioned, The V&A, The National Gallery & National Portrait Gallery at Trafalgar Square & Natural History Museum but also The Royal Albert Hall, home to The Proms since 1941. The Tate Modern, Tate Britain & Saatchi Gallery are a haven for Art Lovers. Windsor Castle, Stonehenge, and Bath Day Trip – More Royal spotting, a mysterious circle of standing stones & UNESCO World Heritage Site frequented by Druids & New Age Travellers for solstice & equinox celebrations & Roman Baths in one of England’s most beautiful cities all in one day! Incredible! Harry Potter Studios & Private Transfer from Central London – Catch the Hogwarts Express at Platform 9 ¾ to the Warner Bros. Studios. Visit Ollivanders Wand Shop & The Great Hall even though you are just a Muggle. Oxford – This architecturally stunning world famous University City is just over 50 miles from London and has so much to offer. Museums, libraries, churches, theatres, a castle, botanic garden, river punting & Alice in Wonderland. Nearby Blenheim Palace & The Cotswolds are worth a look. Much of Downton Abbey was filmed in the area. Brighton – Roughly an hour South by train, this seaside town is perhaps most famous for its Pier, Royal Pavilion, quaint shopping streets, art scene & nightlife. I would love to visit London. Such a great destination Love the list! I'm going to London in September, so this post is just what I needed. Thank you! I would love to try the afternoon tea cruise! What could get more British than that? Excellent information and pictures. London is my dream destination for the holidays. thanks for the useful tips.